Kasey Smith, founder of EterNav, wants to change the funeral and death care industry. With a background in technology startups and personal experience dealing with loss, she saw an opportunity to help those experiencing one of life’s toughest challenges, navigating the unexpected loss of a loved one. She has created 21st century technical tools and a step by step process that helps guide families through the practical tasks and action steps that follow the loss of a loved one. 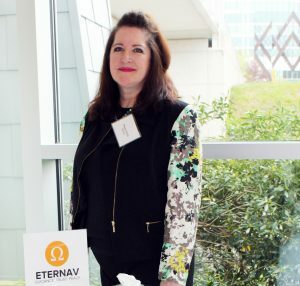 Her solution, called EterNav (short for eternal navigation), offers affordable, personalized and convenient bereavement solutions — working either with and without a funeral home. Smith enlisted the help of Betty Egner and Ann McAlhany, business advisors at the Maine SBDC at CEI, to help launch and grow her business. Since early 2015, Smith has sought the mentorship of Egner who assisted her with various aspects of her business including general principals, startup issues and market research. “Betty has connected me with vitally needed resources from market validation to high quality human resources that were key to taking this business from a dream to a reality. This kind of attention to business needs has allowed me to always be moving forward. Betty has put me in the position of using my best strengths and shown me ways to not get stuck in the process. This elevated view has been a difference maker.” Smith comments. McAlhany also worked extensively with Smith, serving as her mentor through the Maine Center for Entrepreneurial Development’s Top Gun program and helping her apply for funding through the Maine Technology Institute, where she was awarded over $28,000 in Seed and Tech Start Grants. Egner and McAlhany are also assisted Smith as she competed on Greenlight Maine, a statewide business competition between 26 aspiring entrepreneurs for a $100,000 purse. Watch Smith’s Greenlight Maine episode. Also watch her promo video, where she describes her business, her experience and much more. To keep up on this growing business, visit their website or follow them on Facebook, Twitter and Instagram.